The Pioneer Woman is famous for cooking delicious, southern-style meals and desserts. We've picked the best copycat recipes of Pioneer Woman's famous dishes to include in this recipe round up. All of these recipes were inspired in some way by Pioneer Woman's cooking. Whether you need appetizers for game day, a delightful Southern cooked meal for the weekend, or an amazing homemade dessert recipe, we have a great selection for you. 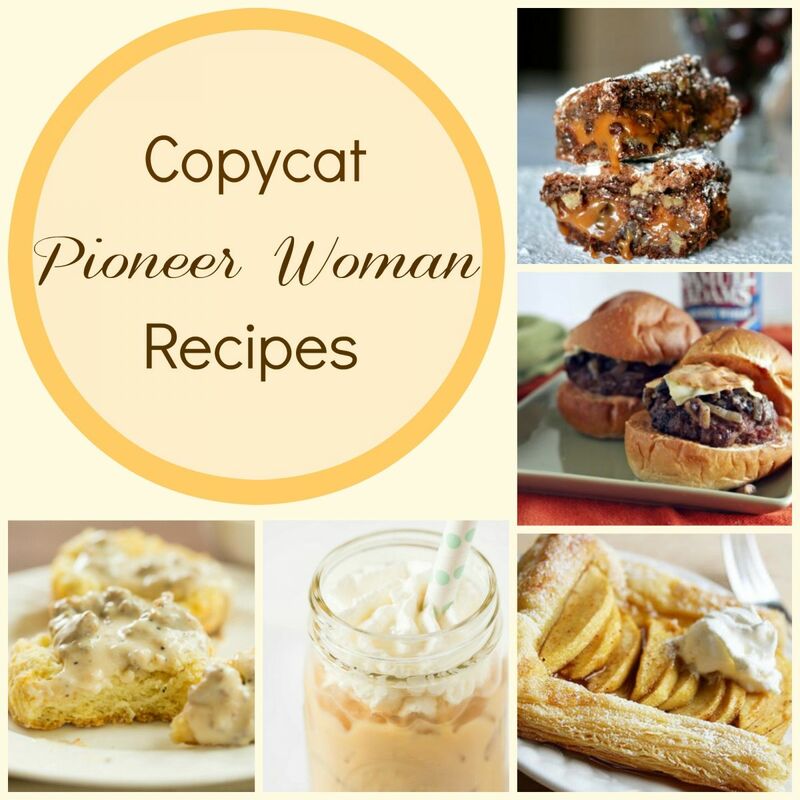 Whether you follow the Pioneer Woman's blog or have seen her on TV, you will adore these copycat recipes. Make sure to try out a few of them and let us know which one was your favorite. For printable copycat recipes, check out our FREE eCookbook, 10 Copycat Recipes from Restaurants & Brand Name Recipes. Copycat Pioneer Woman Cowboy Nachos and Pico de Gallo - This nacho recipe makes an excellent easy appetizer. Cowboy Nachos are served with meat, cheese, tortilla chips, and fresh veggies. Pioneer Woman Mushroom Sliders Copycat - These sliders are made with juicy and cheesy burgers topped with perfectly caramelized onions. They are sure to be a big hit. Copycat Pioneer Woman's Bacon Jalapeno Poppers - These jalapeno peppers are stuffed with cream cheese and wrapped in bacon. You couldn't ask for a better appetizer. Pioneer Woman Biscuits and Gravy Copycat - This classic Southern dish makes a hearty meal for breakfast or for lunch. There is nothing better to fill you up than homemade buttermilk biscuits and thick, creamy sausage gravy. Copycat Pioneer Woman Meatloaf - This classic meatloaf recipe is perfect for family meals. Ground beef is blended with bread and spices to create a filling and satisfying main dish. If you want more Southern recipes, make sure to look at our collection of 21 Tasty Southern Recipes. Just Like Pioneer Woman's Apple Tart - This perfectly spiced apple tart is ideal for breakfast or dessert. A puff pastry crust enfolds apple sliced seasoned with brown sugar, cinnamon, and nutmeg. 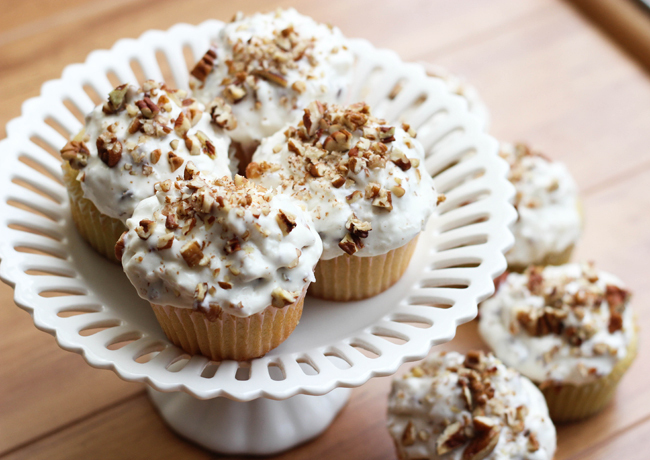 Pioneer Woman Inspired Italian Cream Cupcakes - The cream cake is perfectly fluffy, and is made with buttermilk to give it that rich flavor. The homemade icing has coconut flakes and pecans. Copycat Pioneer Woman Bread Pudding with Whiskey Sauce - This rich and filling dessert is a healthier version of Pioneer Woman's Best Ever Bread Pudding. It is topped with homemade whiskey sauce that can't be beaten. Copycat Pioneer Woman's "Knock You Naked" Brownies - These homemade brownies are loaded with gooey caramels and chopped pecans for extra flavor. Get ready, because these brownies have even more caramels than the original Pioneer Woman recipe. Pioneer Woman Inspired Salted Caramel Brownies - These rich chocolate brownies have a layer of salted caramel on top. They are the perfect warm treat to enjoy after any meal. Just Like Pioneer Woman Tres Leches Cake - This traditional dessert is made with fluffy vanilla cake soaked with a sweet milk mixture. It is absolutely irresistible. Copycat Pioneer Woman Perfect Iced Coffee - Get your iced coffee just right with this recipe for sweet and creamy iced coffee. Do you have a favorite recipe from the Pioneer Woman? Let us know in the comments!